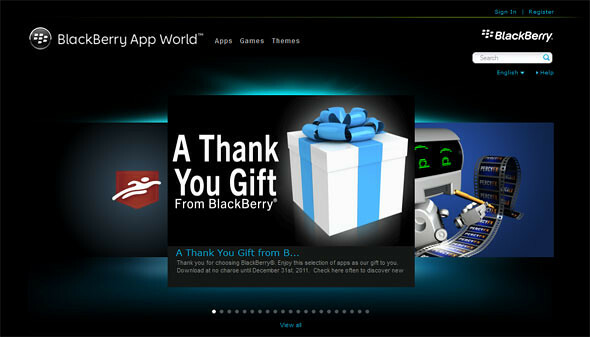 – Request a Gift – BlackBerry users can send their BBM friends a request to buy them an app, theme, or game from the BlackBerry App World catalog. – WiFi Only Support – BlackBerry App World has always worked over WiFi – but required a cellular connection to be present. With BlackBerry App World 3.1, no cellular connection is required! – Content Rating and Filtering – BlackBerry users are now presented with a content rating to alert them to the content contained in an application. These ratings are based on the CTIA Wireless Association’s “Guidelines for App Content Classification and Ratings”. Parents will be able to set a rating filter in the BlackBerry App World client to restrict content of specified ratings from being displayed or purchased. – New Language Support – BlackBerry App World is now available in additional languages including Dutch, Indonesian, Korean, Thai, Vietnamese, Simplified Chinese, and Traditional Chinese. – Multi-Account Support – Have up to five accounts on your Twitter for BlackBerry smartphones app. Switch between accounts and cross-post Tweets and Retweets from one account to another without switching the current account view. – Enhanced “Share with BBM™” functionality – Easily share Tweets with BBM Contacts and Groups. – View multiple Twitter accounts in a single timeline – View a stream of Tweets from up to five Twitter accounts in the Social Feeds timeline, or opt to filter individual Twitter accounts. Post a Tweet to multiple Twitter Accounts – Publish a Tweet to one or more Twitter accounts simultaneously using Social Feeds.